When it comes to shopping online, oftentimes, customers don’t get what they actually want. Italian furniture brand Kristalia wants to eliminate any form of inaccuracy in its furniture so people will get exactly what they see online when the products are delivered to their doorstep. Kristalia did just that by partnering with online configuration system Showefy. One of Kristalia’s most popular furniture designs is the Brioni. It is a family of poufs, lounge chairs and daybeds. The name is in reference to Brijuni Islands, a group of 14 islands in the Adriatic Sea. The furniture design was named after the place because the pieces of the Brioni family look like islets especially when they are shown together--different sizes in various colors showing different beauty rising out of the sea. 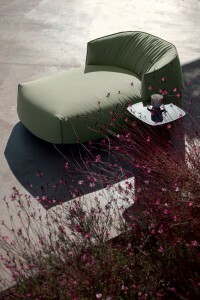 Looking at the Brioni furniture, each piece looks as comfortable as it feels. Not only that, as most poufs go, the Brioni actually looks like indoor furniture. But just like any island, the Brioni prefers the sun and the breeze of the outside world. The upholstery in Brioni furniture is made of Sunbrella fabric, which makes the design great for the outdoors. Sunbrella is water-repellent, which is important for outdoor furniture. It is also stain-resistant, breathable and resistant to ultraviolet rays, another important factor in an outdoor furniture. The bottom of the chair is also lined with a dark band so that it doesn’t have any direct contact with the ground. Brioni is also made of flexible polyester padding that makes it soft and comfortable. The chair also has plastic slats. The entire foundation is encased in water-resistant housing. Each piece is also light, therefore, easy to move around. This will give owners the flexibility to design their outdoors. Not only that, with Showefy, homeowners can make their own configuration and get accurate technical specifications through the Configure / 3D Download button in the Kristalia page. One could choose alternatives like an outdoor or indoor version and a filling finish ranging from fabric to leather. When one has inputted the alternatives, the actual look of the furniture is available for browsing in 3D. One could check out all sides of the chair to get the actual look of the furniture.